Elements of the Nigerian 223rd Infantry Battalion, 1st Nigerian Army Division based out of Kaduna recently responded to an attack by criminal elements in the Tsafe Local Government Area of Zamfara Sate (northwestern Nigeria). The incident was characterised as an attack targeting members of the Nigerian Federal Road Safety Corps, one of whom was killed before the Nigerian military were able to intervene. 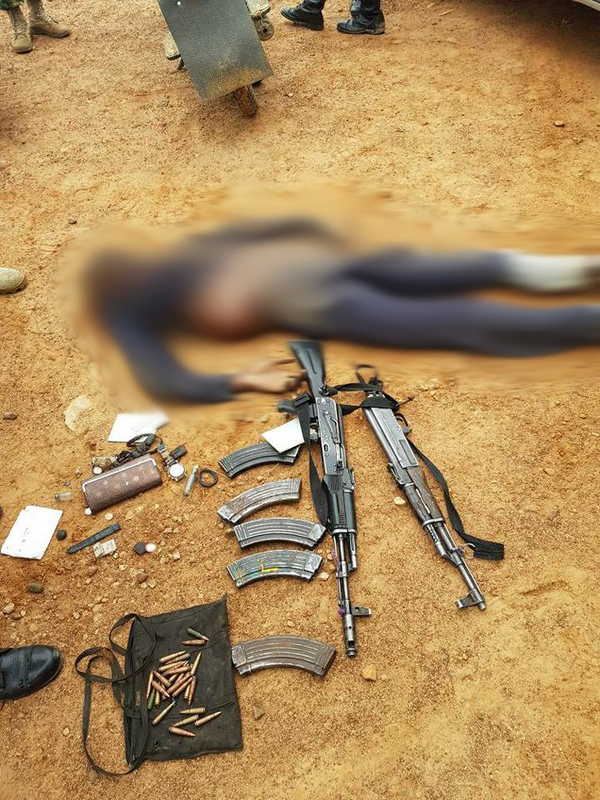 One bandit was also killed, and the criminal group left behind seven motorbikes, two AK type self-loading rifles, assorted ammunition, six magazines, and sundry supplies. One of these self-loading rifles was a 7.62 x 39 mm pattern rifle of early milled construction, missing a wooden buttstock and pistol grip, with the specific manufacturer not identifiable from the available imagery. The presence of only 7.62 x 39 mm ammunition and magazines amongst those recovered suggests that the second rifle is mostly likely an AK-103 model produced by IZHMASH (now Kalashnikov Concern) in Russia. The AK-103 is a comparatively modern variant of the AK family, based primarily on the Avtomat Kalashnikova Modernizirovanniy (AKM), an updated AK series rifle introduced in 1959. It shares features with other rifles in the so-called ‘AK-100 series’, including black synthetic furniture and magazines, a black phosphate finish on metal parts, distinctive AK-74 type muzzle brake, side-folding solid polymer stock, and an optical sight rail on the left-hand side of the receiver. ARES covered an earlier incident that involved a captured AK-103 self-loading rifle in Nigeria, in the vicinity of Dansadau, located some 100 kilometres southwest of the recent incident in Tsafe. Although no specific allegations have been made, it is possible that there is a link between the two criminal groups operating in the area, or at least a common supply line shared by these groups. This particular rifle appears to have seen significant use due to the wear on the finish of rifle, which may indicate alternative supply lines to other, much newer, AK-103 rifles seen elsewhere in Africa. If you are asking the origin of the ak -103 , most likely it was originally delivered to libya. Eric, that is a strong possibility, yes.